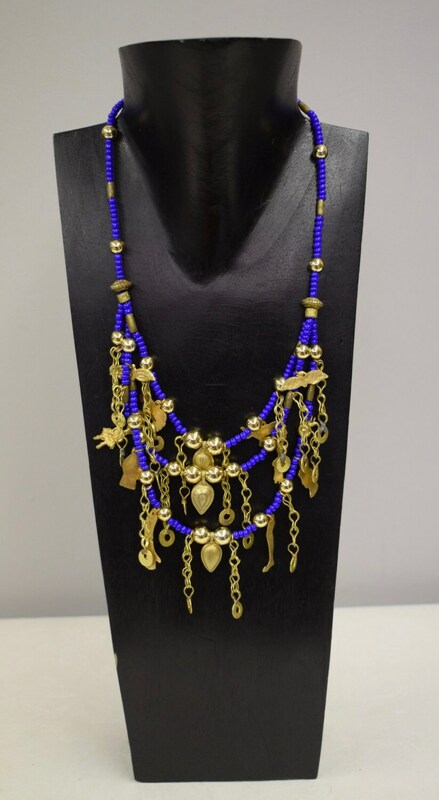 This is a fabulous Vintage 3 Strand Brass Milagros Healing Charm Necklace with Blue Czech Glass, Gold Beads all strung on wire with a gold hook and eye clasp. 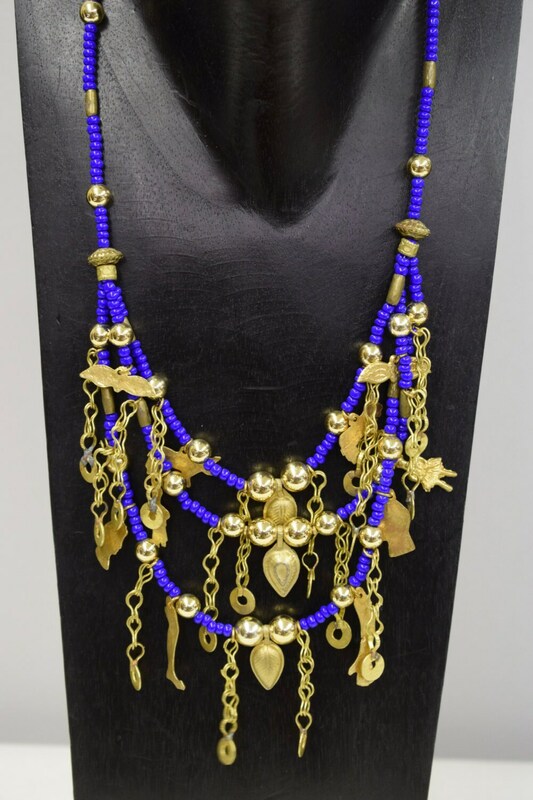 This necklace was part of the Bacara Jewelry Collection of 25 years ago. Milagros are small metal religious charms found in many areas of Latin America, especially Mexico and Peru. The word “Milagro” means “miracle”. They are also used in Europe, where they are often referred to as Exvotos (Offerings). These small charms, often depicting arms, legs, praying people, farm animals and a wide range of other subjects are typically nailed or pinned to crosses or wooden statues of various saints like the Virgin Mary or Christ, sacred objects, pinned on the clothing of saint statues, or hung with little red ribbons or threads from altars and shrines. They are also carried for protection and good luck. 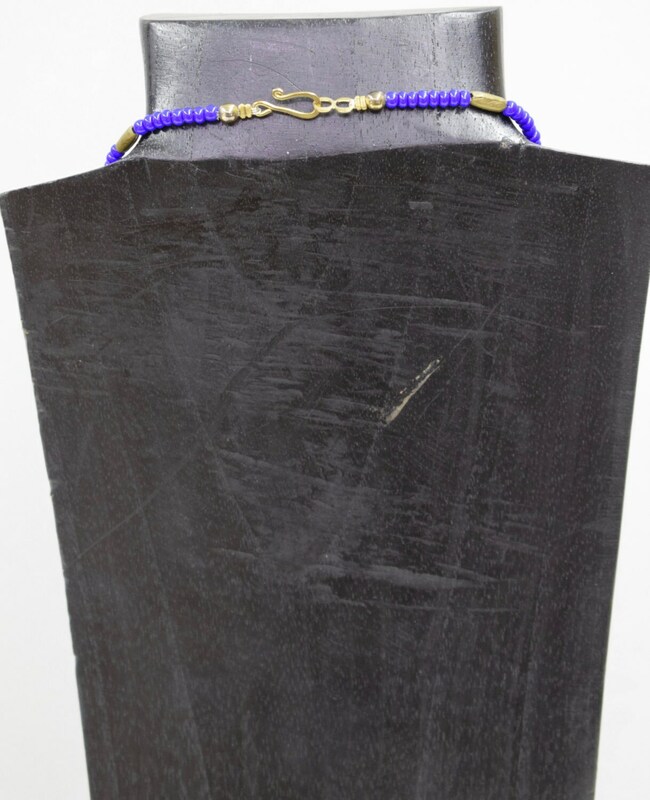 This is a truly a unique and colorful healing necklace that will compliment any outfit. A great gift to give that special someone during the holiday season.